AdaptWest is an initiative of the Cities of Charles Sturt, Port Adelaide Enfield and West Torrens with support from the State and Federal Governments. It is one of 12 designated regions across the South Australia set up to ensure that businesses, communities and environments can respond positively to the challenges of our changing environment. AdaptWest is looking at the adaptability side of the equation across the Western Adelaide Region. In 2014 WACRA members participated in one of a number of workshops designed to identify key areas in the Western Region which might potentially be affected by climate change. As part of this process, one of these Integrated Vulnerability Assessment Workshops was held recently at Torrensville Community Centre. The purpose of this particular workshop was to look at Environment and Natural Resources aspects. 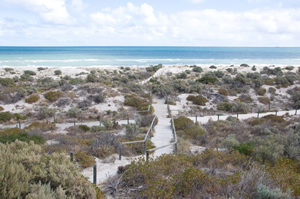 The Tennyson Dunes are the last standing remnant dune on the Adelaide Metropolitan coastline. They are unique for their coastal plants, reptiles and migratory birds. These dunes have a close relationship with the first peoples (Kaurna) and are estimated to be over 6,000 years old. On 27 October 2011 the Tennyson Dunes Group won the Premier’s NRM Community Engagement Award. Thanks to WACRA President Jim Douglas for the nomination and fellow community groups in the area for their recognition. Four community organisations joined forces with the support of Charles Sturt Council and made an application for heritage listing. This can be a long process, so in 2013 it was decided to approach The Hon Ian Hunter, Minister for Sustainability, Environment and Conservation, to make an application for conservation status. The Government shared our collective opinion that these magnificent dunes needed protection and they are now Conservation Protected. Find out more about the Tennyson Dunes. 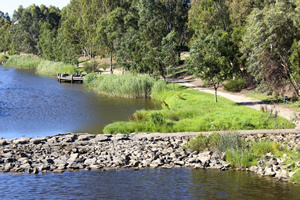 WACRA is thrilled to announce that we have received notification from the Mt Lofty Natural Resources Management Board that $50,000 is allocated to conduct a Community Consultation and Concept Plan for the third stage of the Torrens River Wetlands from Tapleys Hill Road the the river outlet . We have campaigned for this to happen since 2004. We know that this will be a difficult but interesting process, and wait anxiously for the river to run through its final stage to create greater biodiversity and much cleaner water entering Gulf St Vincent.